Although our main focus of attention has been to complete the master bedroom lately but jobs in the bedroom aren't always a two person job and my partner is fine on his own working in the bedroom. Whilst he works in the bedroom adding finishing and final touches I make a start on the landing striping off all the old wallpaper ready to have the landing and stairs plastered. The wall the follows up alongside the stairs is particularly wonky from top to bottom and may need plaster boarding before it is plastered but due to the thickness of the available area we might not be able to use a timber frame to hold the plaster board and may need to use a dot and dab technique for the plaster board. Either way the wallpaper on this wall needs removing and that's my job for the day! 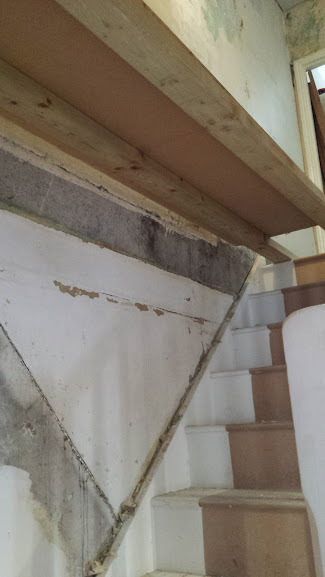 With a make shift plank of wood screwed over the stairs it gives my a rather scary plinth above the stairs to work on the higher parts of the wall. 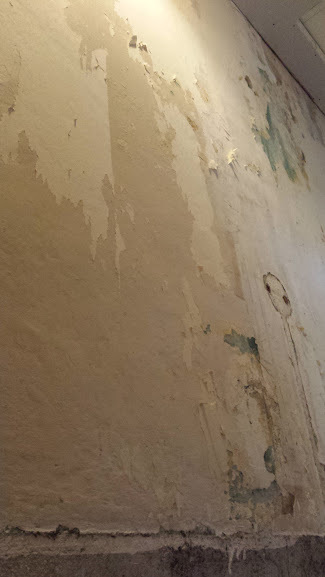 Several hours later the wall is striped of all remnants of wallpaper and lining paper and ready for the next stage in the house. We aren't sure where to spend our money next. Getting the hallway complete would not only transform the upstairs landing but it would be the last remaining bit downstairs that still looks like a building site. But there's a part of me that thinks we should finish the bedrooms first and then move out to the landing. I don't want to be damaging the freshly plastered landing by moving furniture and materials into the other bedrooms. Until we are ready to make that decision it is back to working on the master bedroom to get that one finally finshed.